Everybody knows somebody like Sonny. No matter what happens, its never his fault. Sure, he signed an adjustable rate mortgage, but nobody told him the rate might actually go up. Yes, he also killed his realtor, but he was provoked. He then takes his put-upon employee Cassie Fowler hostage, because she made him nervous talking about cops and ambulances. Sonny never takes responsibility, but nobody gets off easy in Jonathan Watson’s Arizona, which screens during this year’s Sundance Film Festival. The recently divorced Fowler is in roughly the same boat as the man who abducts her. She bought her home from her future boss, only to soon find herself underwater when the market turned. Now, she is struggling to unload similar houses on not-so-unsuspecting buyers, in hopes of making a commission to apply to her deeply-in-arrears mortgage. Sometimes the erratic Sonny will see her as a fellow victim and sometimes as a sub-prime predator, but he has a nasty habit of killing people in front of her, like his callous ex-wife. Of course, it is never his fault, mind you. The stakes start to rise when Sonny sets out to abduct Fowler’s daughter for more leverage. Since the gated communities cratered, people moved away, so there was no much pressure on the one-cop police force to expand. Eventually, the resourceful Fowler slips loose, but there is really no place for her to go. At some point, accounts will just have to be settled. The screenplay by TV writer-producer Luke Del Tredici desperately wants to be topical, but it works better when it settles down and focuses on genre business. If anything, the utterly irresponsible behavior it chronicles undermines its sub-prime messaging. However, the cast still manages to do wonders with the inconsistent material. Rosemarie DeWitt is highly charismatic on screen, which helps make Fowler an appealingly proactive character. 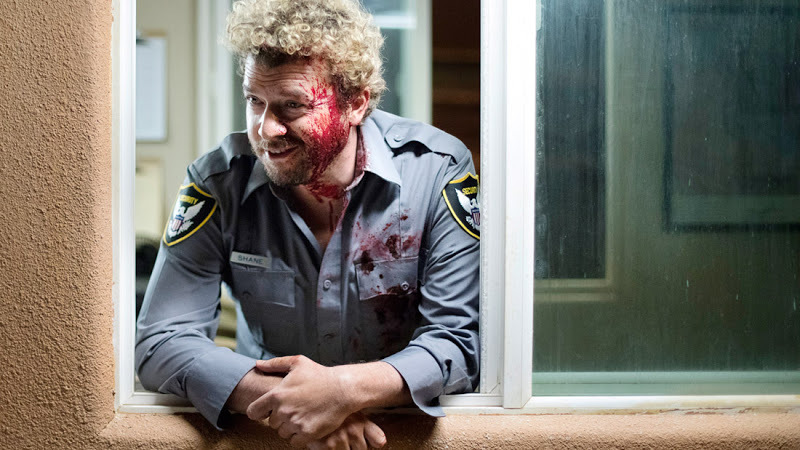 Danny Masterson plays Sonny like a Man-Boy from Hell, basically falling back on his established shtick, but casting it in a darker, more sinister hue. David Alan Grier isn’t around for long, but it is hard to forget his appearance as Coburn, the Keystone-esque cop. Watson fully capitalizes on the loneliness of the Arizona desert (technically shot in New Mexico, but close enough) and the sinister possibilities of the winding lanes and dead-end cul-de-sacs lined with empty foreclosed houses. Its like Detroit in the desert. In truth, it is a tense, competently executed thriller, but it does not belong in the Midnight section (not enough blood or attitude). Earning a moderate recommendation for thriller fans, Arizona screens again tonight (1/27) in Park City, as part of the 2018 Sundance Film Festival.